One very common attack on women -particularly in cases of sexual assaults- is the following: the aggressor, using his left hand, grabs and pulls on the victim's right forearm to drag her to a nearby secondary location. While working on various situations around this scenario with one of my female students, we realized that because of the difference of size/weight between us, what would normally be a simple "arm grab and pull" situation, was in fact much worse for the victim. A basic arm grab & pull situation can be resolved in a couple of ways but the general idea is to move forward, towards your aggressor, and counter-strike rapidly. My favorite move is the side kick to the knee because knees are weak and any damage to the knee is a fight finisher. The technique is demonstrated in the video below by an unknown martial artist in India. 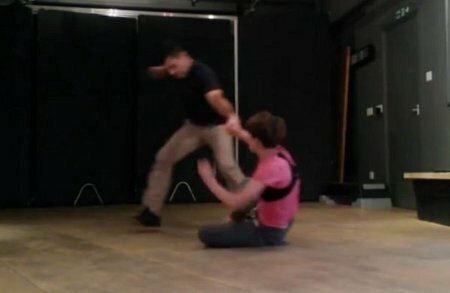 The problem we encountered during our pressure tests, though, is that a fair number of times, the student acting as the victim would simply stumble and fall because of the difference of size/weight with her pretend attacker. She was unable to catch up with her aggressor, the traction would become too strong and she would end up being dragged on the floor unable to defend herself. Looking for a practical and efficient solution we came up with a simple technique. 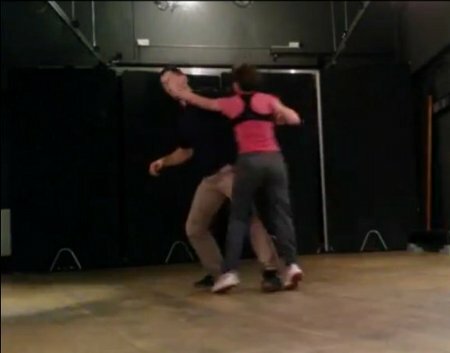 The general idea of this technique is to quickly and suddenly drop to the floor when you realise your aggressor is much stronger than you. Then, as quickly and suddenly, get back up on your feet to counter attack. Although broken down in several sequence here for educational purposes, the whole technique should be just one quick movement. The sudden downward movement will slow down the aggressor or even stop him. It will also allow you to stay in control instead of being dragged helplessly. This is done by folding one of your leg and sitting down almost on your foot. Note: it is important to keep your legs in front of you. The idea is to step on one of his/her feet or at least block his/her legs. That should stop him/her or, at least, further reduce his speed. This will also be useful to get up. Note: Keep your legs between you and your aggressor so if anything goes wrong you can still kick him/her. Use the aggressor's traction and your momentum to get up. Having one leg folded as described in step 1 will make it easier to get up. The difference here is that you'll get the momentum you need to get up mostly through your aggressor's traction. Drill: sit on the floor and try to get up with the help of your hands. Take advantage of your momentum and speed to retaliate. Go for the face first (we recommend palm strikes), then hit the lower body with knees or kicks. Escape as soon as possible. Note: not shown in the video is the fact that the first strike to the face should be followed by a battery attack high and low with forward pressure. We pressure-tested it a lot and it worked consistently. "If you can't avoid going to the ground, try to get up as quickly as possible. Don't stay there"
My student was consistently able to stop the aggressor, get up and deliver a punch followed by a battery attack. Just to be sure, I tried it with other female students who were, again, much lighter than me and again it worked consistently (well over 80% success rate). Again, our problem is that these girls were very often falling to the ground when a bigger guy grab them and pull on their arm. We just worked out a practical solution. In 2015, Francisco Javier Ortega, a policeman, was killed while patrolling a train platform in the Madrid underground. Following a confrontation, the aggressor grabbed the policeman and pulled him towards the track. Both men fell on the tract as a train was getting in. 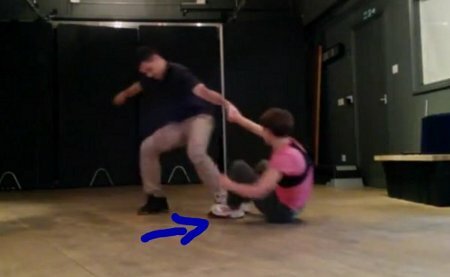 In this situation, dropping to the floor as per our technique might have saved his life. The pair was so close to the track that a more regular technique (steaming in to attack the face) might not have worked. Self-defence is about adapting to situations to find the best option. Not blindly following precepts.